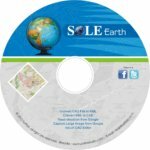 SOLE Earth is a very unique and user friendly software for Land surveyors, civil engineers using DGPS, total stations, GPS and data collectors and wants to work with Google earth. It has very simple and interactive user interface even a newbie work like a professional. It’s very seamless and a time saver (of course save money too). SOLE Earth is works with AutoCAD, so possibilities are endless. Design to the real world! Easy tool to georeferenced the existing drawing. Works on verity of data, even process level from auto cad file. Standalone software no plug-ins and any additional software require. Create smooth contour very fast.